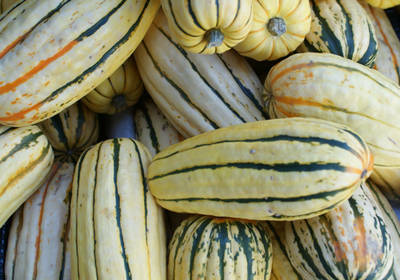 Get to know your Squash! 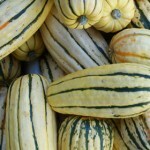 You may recall that I’ve had some confusion with some of the types of squash I have encountered this season. I will always accept gifts of fresh produce that my friends give me (a special thanks to Miss Jennifer who has been the super star of giving this fall! I love her!) None the less, I am still a bit confused and haven’t determined the variety in certain of mystery squash that I was looking for input recently. It was either a Turban or a Butter cup Squash, but I am still not sure which! While shopping at Coborn’s the other day, I was thrilled to come across a free hand out that they had describing the varieties of squash! I had to share! I found some images on line to show you the descriptions for the types so I hope you find it as helpful as I did! hard rind, and unique flesh that separates into strings when cooked Microwave steam, or bake/roast whole, then remove seeds and scrape the flesh with a fork to separate. may be baked or roasted, scoop cooked flesh from skin and puree into soup, mix with cheese and herbs for fresh pasta or ravioli stuffing. Carefully peel squash and dice flesh, then add to broth based soups with lentils, beans or leeks. is an excellent source of dietary fiber and contains vitamin C, B6, magnesium and manganese plus a substantial amount of potassium. they may be peeled, but are more often cooked with their skin-on. Peel and dice, or cut into slices along the natural ribs: toss with oils, spices or herbs and bake or roast. Serve with out without the skin. 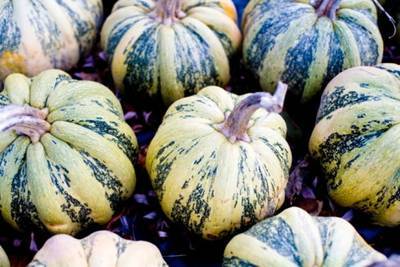 provides the most valuable of any squash, dollar for dollar because it is thin-skinned, has a small cavity with fewer seeds and less waste than with most other squashes. 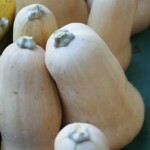 As with other squashes the butternut squash benefits from baking which the develops and deepens the flavor. A relative to the buttercup squash that resembles a small pumpkin with orange skin. Bright orange flesh has a dry sweet taste. Peel it, cute the flesh, roast it, and serve like cut up sweet potatoes. Has an extraordinarily long storage life. Available June to November. Cream colored with orange spots or pale green with dark green spots in vertical stripes. Carnival squash have hard, thick skins and only the flesh is eaten. 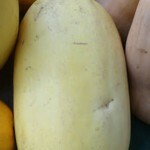 It is sometimes labeled as a type of acorn squash. The delicious yellow meat is reminiscent of sweet potatoes and butternut squash can be baked or steamed and them combines with butter and fresh herbs. Also great in soups. 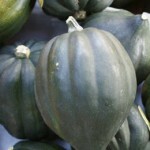 Also called peanut squash and Bohemain squash. 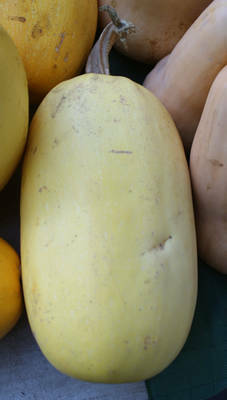 This is one of the tastier winter squashes, with creamy pulp that tastes a bit like corn and sweet potatoes. Size may range from 5 to 10 inches in length. 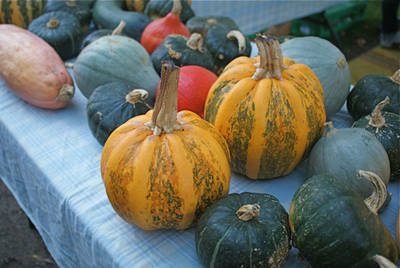 The squash can be baked or steamed. The tin skin is also edible. 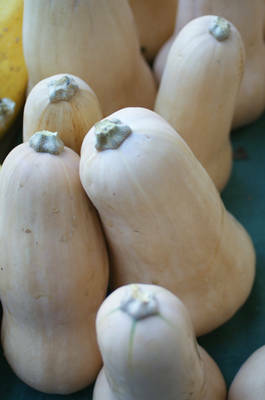 The squash is most commonly baked, but can also be microwaved, sauteed or steamed. It may be stuffed with meat or vegetable mixtures. 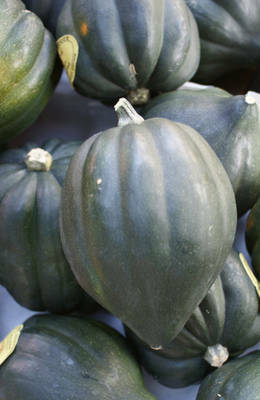 This small, mildly sweet-tasting squash resembles a miniature pumpkin with its top pushed in. It has cream-colored skin with green specks. Weighing only about seven ounces, it has sweet and tender orange flesh and is a great size for stuffing and baking as individual servings. Sweet dumplings are tiny but great for roasting and presenting whole. Happy cooking! 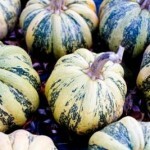 Friends, share your squash ideas and recipes with me please! Glad you enjoyed the squash. There’s more where it came from.